In our first plan, We planned to visit Lempuyang Temple which is located at Karangasem area, East Bali. But, due to the volcanic issue at Mount Agung, we must cancel our plan. It was still in the warning status which the government didn't allow us to enter that area. So, we changed the plan and decided to visit Tirta Empul instead. Set off at 7 a.m., we visited Tirta Empul from our hotel at Kuta area by our rental car. 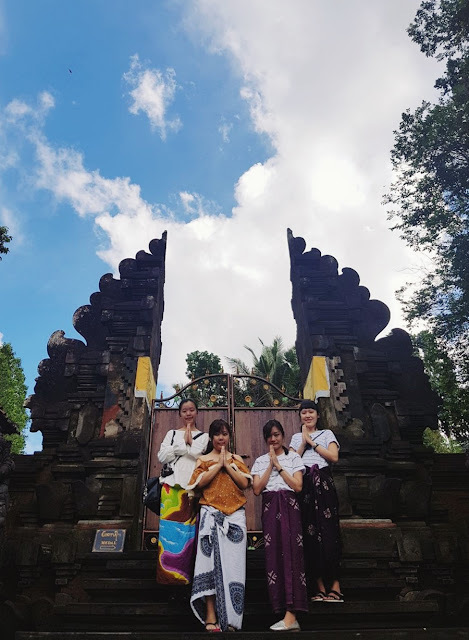 Tirta Empul is a Hindu Balinese water temple which is located in the upper course of Pakerisan River, Manukaya Village, Tampaksiring Sub-District, Gianyar Regency. Tirta Empul is a bathing place with abundant water sources where Balinese Hindus go for ritual purification. The temple pond has a spring which gives out fresh water regularly, which they consider to be holy. And... Tirta Empul means Holy Spring in Balinese. We didn't expect this. I didn't expect this. I didn't expect if it would be a lot of people on this day. I didn't know if they would do ritual purification and pray on this day. Remembered, I didn't expect if I would visit here too. So excited that I could learn and experience something new, the unique cultural activities that Indonesia has! And... Luckily, even there was the ritual purification and pray, they still allowed us too to enter the temple with some conditions. First, we should wear the polite dress or wear scarves or sarong. Second, Women in the state of menstruation is forbidden to enter the temple. Lastly, we should respect the others who were praying by kept the silence. Thank you! They were queueing to get the holy water, bathing, and praying for the ritual purification. There were a lot of big Koi fishes besides of the holy spring. The scene was just so fine! The temple was so peaceful. And... I felt this was something good to visit a temple on the first day of the year. I don't know why... I felt the positive energy went into my soul and reminded me too to do something good in this year for God, for the universe, and for the people. And... I think I should keep repeating this activity every year. I think It will become a good habit. Don't you agree? Hindu is one of the religions that Indonesia embraced, besides of Islam, Christian, Catholic, and Buddhist. The diversity that makes Indonesia wonderful. Because of that diversity, now I'm learning one more of the beautiful culture. The beautiful culture how they prepare the ritual to pray for their Gods, how they pray together in unity, how they bowed the head to God, and how they respect each other. An unusual thing to see and experience. So interesting! The modern building which is behind of the Pura is one of the palaces for our president in Indonesia. They said this palace was built in 1954 for our first president, Soekarno. But now, the government palace is now used as a place for visiting dignitaries and important guests. "The magical feeling in the morning." Okay, that's it guys the experiences that I had when I visit Tirta Empul Temple. Have you enjoyed Tirta Empul's article? Have you enjoyed my photography? Have you enjoyed my perspective? Let me know by giving a comment on the comment box below! :)) Thanks before! However... I enjoyed it too! I enjoyed when I shot the moments. The moments where there were the unique human activities and the architecture involved! So satisfied! Hope I can have this moment again in the other different experience! If I have any mistakes in this article by its writing, words, or photography. See you in the next post! I'll visit the other awesome temple in Bali!